I've been as busy as a cat covering dirt, but I guess it doesn't show here. I've spent a lot of time watching Richard Brand paddling around the Eastern U.S. (Captured Heartbeats) If you haven't been following, you are missing a great adventure. Just click Captured Heartbeats Tracker and Facebook in the right margin under Favorite Links. He passed St. Marks Lighthouse night before last, and has now turned south on the Florida Big Bend. He is now sleeping soundly (at this writing) in the Econfina River campsite. picture of the birth of an obsession. Well, the die is cast. 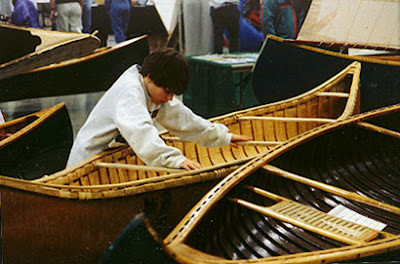 We've been talking about going to Canoecopia for several years. This year we've made the leap. I ordered tickets and made a reservation for lodging, and will now watch the weather in the frigid North. We always loved going to the annual sailboat show in Annapolis, but only had to drive about 40 miles for that. This will be 1,700 miles round-trip. Unless this will be something that will get in our blood, it will probably be a once-in-a-lifetime experience, but we're looking forward to it. I made 100.75 miles for my 3-P-100 in January, but this month the weather has been horrid. It has been warmer than normal, and that is nice, but the wind has been 35 to 45 to 55 mph. When I go out for my walk, I collect aluminum cans to help Canton Lake with their reforestation fundraising project. Everything was destroyed by a tornado three years ago. Climbing up and down deep ditch banks in 45 mph winds gets exhausting in short order. After a mile and a half, I'm convinced it's three miles and call it a day. Bike riding is my other means of keeping the body working, but I went out several days ago and broke a spoke in the rear wheel. This was the third spoke broken and replaced. I called the bike shop only to find they have taken a winter vacation. That's a smart move, considering this has to be their slowest time of the year. All the spokes will be replaced with stainless steel shortly, and I'm hoping that will solve my problem. Beyond these happenings, I've been working in the shop on wood projects. The smell of wood dust is surely a better harbinger of spring than a sleepy groundhog.